This entry was posted in Balance, Consistent Care, Family Structure, Responding With Sensitivity, Routines and Schedules, Work and Family and tagged authentic parenting. Bookmark the permalink. I know when it’s coming. The inevitable breakdown as a result of over-scheduling. I don’t even need to look at the calendar board to tell it’s coming. I can tell because I wake with dread for the day and am short with my husband because he isn’t a morning person like me. I huff and puff instead of responding kindly when the kids need me. I can’t focus, and I find myself wandering from task to task around the house. Recently, I’ve come to the realization that in my attempts to be a balanced person, I have had to dig a bit deeper into myself and discover my boundaries. Do you know your social needs? Mine are limited. I don’t want a play date every day. If I spend more than an hour total on the phone in a day, I get grumpy. This isn’t really a new thing in my life since becoming a parent; I’ve always been a homebody. I would rather communicate via handwritten letter than face to face most days. My children, thankfully, also prefer the quiet of our home and our simple family rhythm, so I’m not fighting against the current. What I am fighting is my own need to be approved by others. It’s not uncommon for us to feel like we need to please everyone around us and care for their emotional needs. As parents, that’s what it seems like we do all day, every day. But we have to remember to take care of the person doing the caregiving. Just as we have regular check-ups for our teeth, we need to take the time to sit down and take inventory of our lives. As I type this, to my left is a list of all the things I have in the next week, and they are divided by priority. There are several things crossed off. Those things required phone calls and emails to inform people I wouldn’t be there. The world will not fall apart if I admit I’m not supermom. My children need to see me set limits, and my peers need to see me set limits. Part of being a natural parent is learning to listen to our children and their individual needs, to treat them and ourselves with respect and live gently. Our society might think we are wasting time and efficiency by setting aside more quiet time. In the world we live in, it can be hard to set healthy boundaries, but I encourage you to take a moment and consider an area of your schedule where you could trim the fat and respect yourself a little bit more. 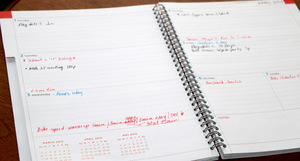 How have you unburdened an overloaded calendar? In December of last year I had an epiphany about our family schedule (mom working half time, dad working out of the home, 3 daughters all in activities, school, etc). After taking time out from some things (and outright quitting some), I found myself in an over scheduled situation again in early spring with increasing work commitments, 4 family birthdays, preparing for a vacation, etc. I like your idea of scheduling a regular family schedule check-up. Needs constantly change in a family and it is important to reassess how it is working for everyone. I agree with your, too about fighting to need for approval from others socially. I am an introvert by nature and require less social interaction that other people, but I too find that others don’t understand. I think there is too much pressure for everyone to be the same, like being extroverted and a leader in all situations is the gold standard, and it is not. I’m preparing myself for the Fall and sports/school commitments… the temptation to fill my calendar will be here before I know it!